(PhysOrg.com) -- Taking light control to a new level, scientists have proposed a technique for confining light into an area just 1/500th the size of the light's wavelength. Since funneling light through such tiny spaces enhances the optical fields and increases the light's transmission, it could lead to a variety of new optical applications. The researchers, G. Subramania from Sandia National Laboratories and the University of New Mexico, S. Foteinopoulou from the University of Exeter, UK, and I. Brener from Sandia National Laboratories, have published their study on the new light funneling technique in a recent issue of Physical Review Letters. In the efficient power funneling of light, the amount of transmitted light is larger than predicted based on the area of the holes through which the light travels. This phenomenon, which was first demonstrated in 1998, is called extraordinary optical transmission (EOT) and has been produced by surface plasmons excited on the surface of thin metal films patterned with tiny holes. However, this process is resonant, meaning it only works with light of a very narrow spectrum. Since funneling light of a wide range of wavelengths could be very useful for applications, scientists are interested in alternative techniques for funneling light that are nonresonant, and therefore, broadband. The broadband functionality [of a nonresonant device] allows for flexible utilization in many applications, thus considerably relaxing the stringent design requirements of resonant devices, the authors wrote in their study. 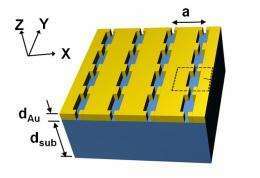 Toward this goal, the scientists proposed a structure consisting of ultra-subwavelength channels that, according to calculations, can efficiently funnel and enhance the intensity of light by a nonresonant mechanism. The device is composed of a periodic pattern of alternating small and large rectangular slits engraved on a thin gold film that rests on a substrate. While the large slits enable a more efficient funneling of light through the small slits, the smaller slits provide tighter confinement for greater light enhancement. The proposed structure demonstrates a high power confinement factor (PCF), which serves as a figure-of-merit. The PCF is defined as the fraction of incident power that gets funneled through the small-slit region divided by the area of the small-slit region. The higher the PCF, the greater the enhancement of the optical fields. The scientists calculated that these structures should be able to enhance light with a PCF of 13-20 over a broad wavelength range of 3-20 micrometers. The lower part of this range is the mid-infrared, which is particularly useful for applications such as molecular fingerprinting or sensing, as well as infrared detectors. The structures could also have applications in optofluidic devices and the enhancement of nonlinear phenomena. Since nanofabrication techniques are constantly improving, the scientists predict that it should be possible to fabricate these structures in the near future. While decreasing the width of the small slit could allow for greater light enhancement, the researchers note that there exists a lower bound on the width due to the onset of quantum tunneling, as well as fabrication constraints. for 10micron wavelength, 1/500th of this is ~20nm. 20nm structures seems possible. let's combine this with quantum-confined semiconducting lasers to get some really crazy stuff.